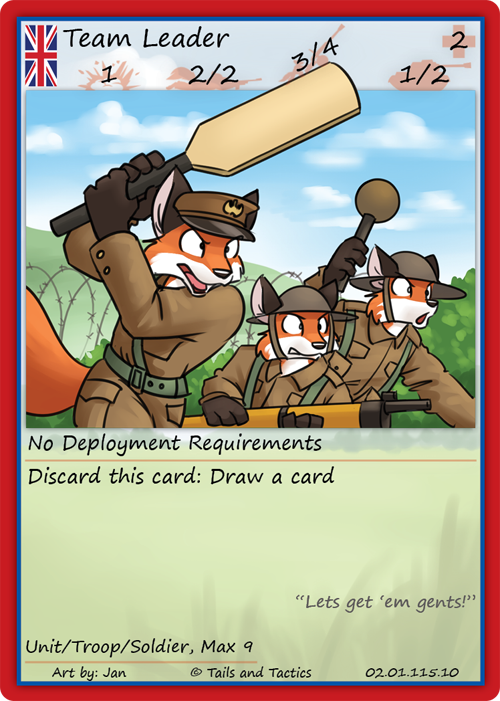 This is what the Team Leader card might look like for the British Deck in Series 2 of Tails and Tactics! What do you think? 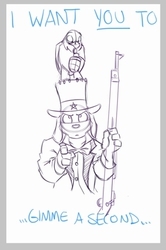 You asked for larger drawings and we listened! We took your advice and got such large art it doesn't even fit in the frame! This card is a work-in-progress for Series 2. The real print may look a little different, we'll have to see if we change anything else. Got any ideas? Visit our forum at http://tailsandtactics.com/forum/ and let us know! Series 2 will include the British and Italian decks and will also add randomized booster packs! However, we can't do it alone. We need your help! 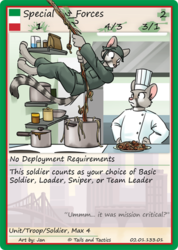 If we don't make enough from sales of Series 1 on our online store (http://tailsandtactics.com/shop/) we can't afford to pay our artists and print the cards. Purchase decks, posters, a book, anything helps guys! More cards coming soon! I'm having some serious problems with InDesign, but when they're resolved we can show you guys the Italians!